December 23 and oontinaed through January 25, 1963.
from $145.4 to $130.3 million. from $197.7 million in February to $190.0 million in March. Defense Military Asaistance Program-GranL-Aid shipments (for which separate fig. documents. For the figures shown in this report the sampling variability can be ig. port of exportation. 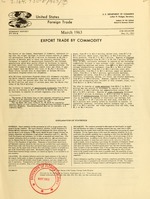 Transportation and other costs beyond the United States port of statement, see foreword in Foreign Commerce and Navigation of the United States. For sale by the the Census, Washington 25, D.C. Price 10 per copy. \Aqn ual subscription 00, 930, 950, 970, 975, 985, and 986 combined) $5.00. (Quantity in units indicated, value in millions of dollars. Figures for 1963 are as originally issued and have not been revised to include published corrections. Vegetables, fresh or dried ....................... 1,000 lb.. Supplement to Report No. FT 930-E showing the Schedule B numbers included in the individual economic class and commodity totals =s available on request.